ISSMA SEMI-STATE is the stepping stone to STATE finals. 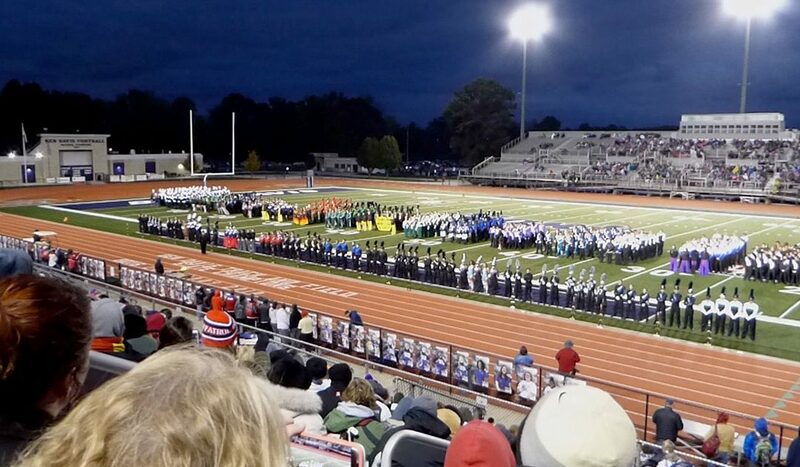 The top 10 bands advance to State Finals at Lucas Oil Stadium onNovember 3. At the conclusion of the performances, during awards, there will be a brief presentation of awards and announcement of the bands that have qualified for state. Not all the students come to the field, it is a senior retreat from each band. This is a very exciting moment for the band, so please plan to stay and support them for the awards presentation. It will be cold! Please take our advice and dress very warm. Even if it does not feel cold, after you spend 6 hours outside you will be quite chilly! Arrive at the beginning of a performance block for the best chance for good seats. Arrive early, ISSMA will NOT let you enter the stands during a performance. This is strictly enforced. Bring blankets, sleeping bags, a thermos, hand warmers, and other cold weather gear! Parking at Ben Davis H.S. is especially challenging on this day. Even more than the Ben Davis Invitational. Most of the bands at this event are large, and that means more spectators. Make noise, and support our Tigers when they come out! If you aren’t loud, they cannot hear us. So be loud, proud, and respectful! On that note, make sure you support all the other bands. The stands are tight quarters, so be positive and encouraging about every band, you never know who is nearby. Stay for awards, it will be worth the wait! NOTE – Children under two years of age, carried in arms, will be admitted free of charge to any ISSMA event. The bands, if returning to the stadium after performing, must sit in the east bleachers ONLY. If your students would like to sit on the performance side during the contest they must purchase a ticket. Seating is very limited in the main grandstands and must be reserved for paying spectators and chaperones only. Please note: Staff are asked to save the Home side seating for paying spectators if the stands become extremely crowded. Sitting in the aisles of the stadium cannot be allowed due to Indiana fire codes. Concessions will be available at the stadium. Together, as the unified family of the 2018 Fishers High School Marching TIGER Band, we dedicate ourselves to build upon our firm foundation of excellence in music and motion through integrity, discipline, respect, and trust. We shall focus on the task at hand with a passionate sense of urgency by consistently giving our personal and collective best. We will continually raise the standards of each performer, maximizing the total potential of the group and achieving a sense of success regardless of competitive result. Through cooperation and perseverance, we will achieve unity, excellence, and lasting friendships, ultimately developing the skills necessary for success in band and in life. Video recording of shows is NOT permitted unless the person doing the recording has written synchronization documentation from those who hold the rights to the music being performed.